September 19, 2018 ~ We caught up with Jane Miller, a Mandel School alumnus who will be part of Alumni Authors Alley on October 12. Miller is a licensed independent social worker, psychiatric service dog trainer, certified dog behavior consultant, celebrated author, and founder of Healing Companions, Inc. Healing Companions is a non-profit organization dedicated to assisting people with disabilities such as depression, post-traumatic stress, bipolar disorder, anxiety, panic attacks and more, by partnering them with Psychiatric Service Dogs In-training (PSDIT). 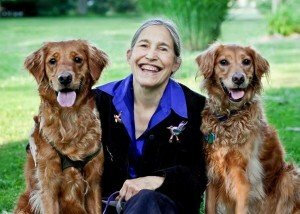 Her book, Healing Companions: Ordinary Dogs and Their Extraordinary Power to Transform Lives is a groundbreaking book that provides a window into the new world of Psychiatric Service Dogs (PSDs) and how they can offer some of society’s most vulnerable people a second chance at life. The book is a great read that offers hope and shares stories of how these dogs have changed and enhanced the lives of their human companions. In Healing Companions, Jane Miller introduces these amazing dogs and explains how they have helped vulnerable people improve their lives in profound and unexpected ways. PSDs have allowed them to gain self-esteem, self-confidence, assertiveness, and so much more. 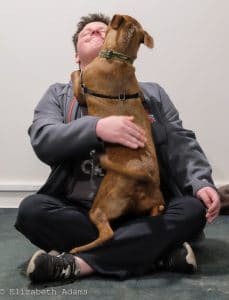 These dogs provide emotional support, as all dogs do, but they are specifically trained to perform certain tasks unique to each individual’s needs. First, we would like to thank Gina Lallo, Founder of Forget Me Not Animal Rescue, for donating Colton to our program, Joette Mehalio, Foster mom and training home for Colton and Jennifer Mauger, CPDT-KSA, KPA-CPT, Owner/Trainer L’Chaim Canine, for helping train Joette to prepare Colton for Brian. We are deeply touched, grateful, and appreciative of everything they have done for Brian, Colton and Healing Companions, Inc. A truly magical gift that will change so many lives. Thanks so much for everything. WOW! Thanks DogWise Books for the wonderful and immensely generous donations of books and DVDs for our prison training program. The inmates have never received such an amazing donation and they will be thrilled!